Confounding as it may be, in this gesture lies His master stroke. His mission was to uplift and transform mankind, and one of the catalysts He chose for this purpose was His students. He gave them education, morality and many such gifts; but greatest of them all, was the sense of belonging. He called them His own, and in the process made His mission theirs. Dr. Rajeshwari Patel (Reader and Head, Department of English, Anantapur Campus) is a former student of Baba’s college. But one unique thing about her stay in Bhagawan’s hostel is that she became an inmate, years before she actually joined the college. In this conversation with Prof. G. Venkataraman, she recollects the glorious early days of the Anantapur Campus when Swami spent much time nurturing this edifice, that for generations to come will shine forth as an example in women’s education. Presented below are excerpts from that conversation recorded in 2007. Dr. Rajeshwari Patel (Dr. RP): In 1972, I joined the ninth standard. At that time there was no school of Bhagawan in Anantapur. But He had told my mother that He would keep us with Him (Dr. Patel’s family was residing in Kampala, Uganda then). Swami personally got the admission for us; He instructed the then Principal, Mrs. Anima Mukherjee to go to the only english medium school around, the LRG School and get admission for us. During those years, He used to come almost every month. He used to drop in at Anantapur and stay for a few hours and return. I don’t remember any time or any visit of Swami during that period when I was not present. I used to get the news that Swami was about to come. And the strange thing was, whenever Swami came, for some reason, I returned from school to hostel. Either there was a strike or somebody passed away or the school was closed early or something. I remember Anima Mukherjee madam would tell me, “You sit near the gate. When you see the red car (Swami’s car) at a distance, you come running and tell me.” And I used to be in my school uniform, the half skirt. So as soon as I saw the Red Car at a distance, I would just double up and tell her Swami is about to come. Then I would run up to the hostel, drape a sari around myself and be there waiting at the entrance panting for my breath. The beautiful thing was that He used to come and sit inside the classroom when the classes were going on. He would sit behind and listen to the lecture. Prof. G. Venkataraman (Prof. GV): How did the class run when He was around? If I were the teacher I would be petrified. I still am when asked to speak in front of Swami! When in the campus, He used to come down to the common room, that’s where He used to have His breakfast, lunch, etc. He would come down singing or humming a tune. Once I remember He was singing the tune of the bhajan Jayama, Jayama.... very casually while coming down. He would walk down the staircase and walk amongst us when we were singing suprabhatham. We then used to have Nagar sankeerthan every day when Swami was in the campus and He would give us darshan. Prof. GV: How often did Swami come to Anantapur during that period? Dr. RP: During the first few years He used to come every month but then only a couple of times during the year. In the 80s, He used to come for a few hours, attend a program and then leave. Those were beautiful days. He would ask the Principal who were the good students in the campus. Comparing us with the boys He would ask us, ”Can any of you speak? You know, when I tell My boys to speak they can do it offhand.” A few of us would speak for five or six minutes. Then He would ask somebody to sing. He would ask Jayamma madam to sing quite often and when she would start singing Meera bhajans, Swami would Himself join and start singing. Invariably every year He used to come to Anantapur a month before the summer course and ask us to come. He would tell us, “I have come to invite you all’. One year He didn’t come but He sent for us so we came to Puttaparthi. Prof. GV: When He was there in the college did He grant darshans to public? Dr. RP: Yes, the college is a circular building with a lawn in the centre and that’s where we would have darshan. They used to put up a marquee outside and the public used to sit there for darshan. He would even call people for interviews when He wanted to. The days He spent there, He made us plant the grass for the lawn and from upstairs He would supervise the work. Often from His room He would ask us if we are okay, if the food is alright and would generally enquire with everyone about their welfare. He interacted with us in such a way that we used to think of Him all the time. Prof. GV: How would you describe the impact He made on the students and staff? Dr. RP: He changed our lives! Those days we felt charged up, that we were a part of His great Mission; He made us feel that we are doing His work. Prof. GV: How were students and staff made to feel a part of His great mission and what impact did that have on you all? Dr. RP: Every week a bus used to be sent to Anantapur and we used to come to Puttaparthi to help with the construction of the Sarva Dharma Stupa and be a part of it (The Stupa was constructed in 1975). When we now see that structure (beside the current Yajur Mandir), we remember that we put our hands into it. Swami used to come and supervise. Once I remember He gave us an interview there sitting on one small chair and we all sat around Him on the sand around near the Stupa. When the Poorna Chandra Auditorium was being constructed, He called us several times and included us in the construction. He gave us the task of separating the good bricks from the concrete rubble so they can be reused. We felt we were a part of His work. 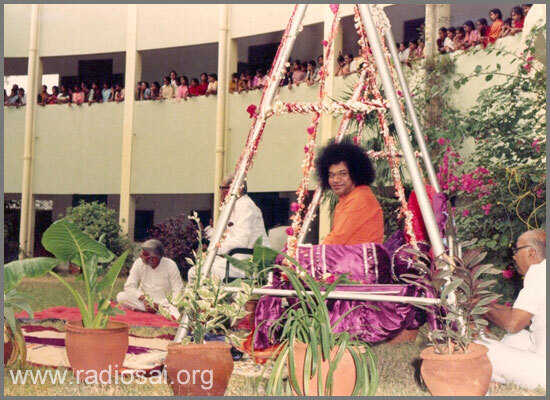 Whenever there was a festival or during the long period of Birthday festivities, in shifts we were put in charge of different departments here in the Ashram like monitoring the safe custody, running the book stall, the canteen, the stores, etc. We would not sit or rest - most of the time we were engaged in playing the host or working. Serving gave us more joy and instead of going for darshan we used to cut vegetables, roll chapatti, and so on. Whenever there was any major function or festival or important person visiting Puttaparthi, He used to write and call us over. He made us feel part of the big work that He was doing. That is what inspired us to remain like this (Dr. Patel is one of those students who have remained unmarried, serving Swami by staying in the hostel and taking care of His students). We didn’t want to enter into any other sphere of worldly life. We wanted to totally give ourselves to Swami. Prof. GV: It is on record that Swami used to write letters regularly to students at Brindavan. Did He write to you? Can you tell something about it? To whom did He write? Dr. RP: Yes, He would write to the students regularly and send it to the warden. The warden would read the letter and we used to copy them into our note books. Prof. GV: Any notable incident you can recall from when Swami used to visit? Let me share with you an incident: Shiva Shankar Sai (former warden, Prasanthi Nilayam campus) was telling me about an incident when He was a student. Swami was in Brindavan and there was some infringement of discipline and Swami got up and was angry. He got into the car and left. The warden wrote to Swami saying our boys are crying. That was a very touching and beautiful revelation. Is there any incident that you can recall that sheds some deeper light on this intimate relationship? Dr. RP: Once we had a Ramayana Seminar on the campus. Many people had been invited and arrangements for their stay were made and everything was ready for the inaugural ceremony. Swami had also come. Those days the college was not surrounded by this long wall, there were only railings. Some engineering college students were on strike and started causing trouble, shouting slogans and things like that. Whether Swami anticipated more trouble or not we do not know. In the early hours of the morning He suddenly left drowning us all in despair. He was very unhappy for some reason. We thought Swami would grace this whole grand function and have the opportunity to exchange ideas with scholars and of course topping it with icing would be Swami’s discourse. But He had gone and we were very upset and disappointed. Later He wrote to us saying He didn’t want to stay because the strike would have affected the program. That’s why He went away. After that we wrote many letters to Swami asking Him to come. 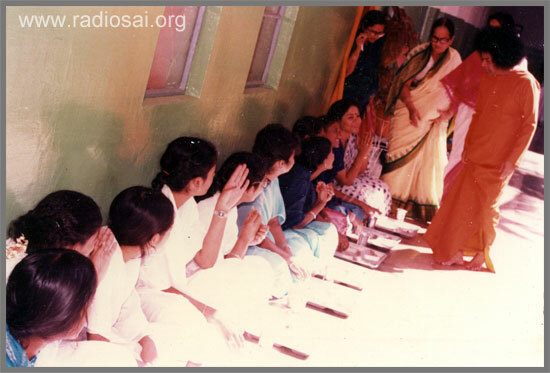 When Swami did not come even then, a group of girls went on a kind of strike. They said that they will not come to the college until Swami comes to the college. They sat in the bhajan hall singing bhajans, refusing to come to the college for classes. I was not among them but this is what happened. Prof. GV: I would say this is arm-twisting! Can you tell us about the impact of Swami making Himself scarce? What impact this change had on the students? Dr. RP: Can I be frank about it? 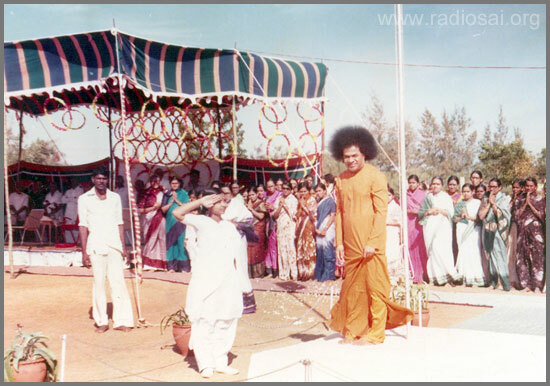 Swami's last visit was in 1989 when we performed a play for Swami; He liked it so much He asked us to perform it again in Puttaparthi for the Messengers of Sathya Sai annual function. During this time when one of the teachers said something to Him, He replied, “Who knows when I will come here next, who will be here and who will not be here.” He made a very vague statement and made us think. After that He never returned. I feel because the current students haven’t seen Swami on campus it has made a qualitative difference. The earlier batches saw Him and saw how He would relate to us. He is very different when on campus - more close and informal. The new batches don’t understand. Prof. GV: I agree. Not looking at the emotional quotient but the spiritual development. Even the people who are coming now feel a kind of spiritual impact which is different. I would say a benign spiritual impact without the personal intimacy. That personal aspect has faded away, it just has to go away sometime or the other. Some see it as a calamity, some take it as a change of gear. Fundamentally what does it do to the personality and character of the student? The whole aim of the Institute is to mould the person. Are we continuing to succeed and how? Dr. RP: I think not having Swami physically, in a way is making the students think of Swami’s teachings more. When they don’t have the physical proximity and they want it, they tend to develop spiritually by going inwards. It is also happening with us. Earlier we were very close to Swami in the physical sense, we related everything to that Form. Now that we don’t have it, we have to live up to ideals, we are working harder on ourselves and in the process it is also rubbing off on the girls. Even if Swami doesn’t come here or talk, Swami is watching all the time and there is proof everyday. Whenever they have an inner conflict, they share it in the class. Suppose we have a discussion, they themselves come up with some insights. This way they are growing much more spiritually. Prof. GV: You have been in the system for quarter of a century or more, in your opinion why is that Swami started a women’s college? What is your personal view? Dr. RP: I think Swami sees women as the foundation on which the culture of the country can be built. For a long time women’s education was neglected. Swami has set right the imbalance by first starting with a women’s college. Also He feels that if women are disciplined and have character, if women have a goal and are strong, then we can build a strong nation. This education will then be imparted to the next generation. When Swami started the culture class on Thursdays, He said, “I want My girls to be instructed on what is Indian culture.” Right from the beginning He has been taking personal interest in the curriculum. For instance we have the yogasanas. He used to say that girls should be fit, they should learn this ancient yoga; He insisted we should go out for games in the evenings because a healthy body and a sound mind are interconnected. Then sometime down the line, He said, “Let us have one day fixed only for cultural programs.” He also introduced the concept of Self-Reliance. In our days every morning we used to do vegetable cutting, chapatti rolling, tending the garden, doing social work, etc. This concept remains the same today. Prof. GV: Now a rather uncomfortable question. Take Dharma Vahini which tells us about the principles of dharma and how we should sustain dharma in daily life. If you tell this to today’s students and young people, they will say ‘Hello, the world has changed. This won’t work, I don’t buy that’. Is our system still able to convince the students? Is your campus able to convince the girls that what Swami says in Dharma Vahini is meaningful, relevant and is necessary? Are they convinced? Can you illustrate that by citing examples of ex-students? That’s where the proof of the pudding is. Do they believe in what Swami says? Do they follow what Swami says when they go out in the world? Dr. RP: I think the answer is Yes! I know my own contemporaries. Some of them were very mischievous, they were, you could say quite indisciplined. But when they became ex-students and when they went into the world they suddenly started practicing Swami’s teachings which they never practised here. They came back to say that ‘when we went out, that is when we realized the value of what we have been taught. It works and it helped’. There are some students who say that the discipline they learnt here, has sort of got ingrained in them. Whether at work or at office, they stand out. Their employers also prefer these kinds of disciplined workers in their offices. If you take at least one value or discipline it definitely makes an impact. They realize that they are able to work more efficiently, more competently. If you talk about Dharma and Adharma, the world has gone berserk. Some of the values we teach to the present day students confuse them, it even makes them appear like misfits. But the churning takes place inside and sooner or later they come back on track. They realise that eventually they will only be successful in life by following Swami’s teachings. 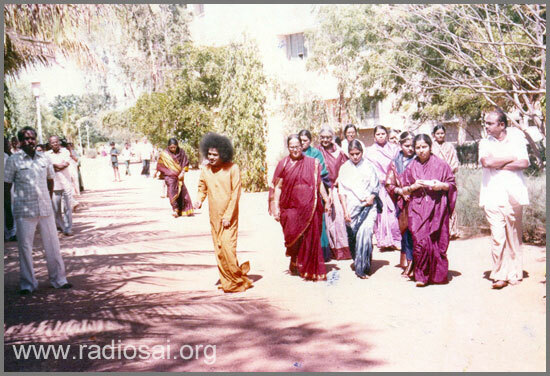 Some of them may go in the wrong direction but I have seen how everyone comes back to Swami’s teaching sooner or later. Because it works! Otherwise they won’t be going back to Swami. Prof. GV: Many of the students who left around the mid 70’s will have children of their own. Are those children on this track or dragged down by current fads and fashions projected by the media? Dr. RP: A few are like that, some of the students have tread away. However about 75% of the next generation is safely protected. Once Swami had called us ex-students for an interview; it was jam-packed and we were almost sitting on top of each other. 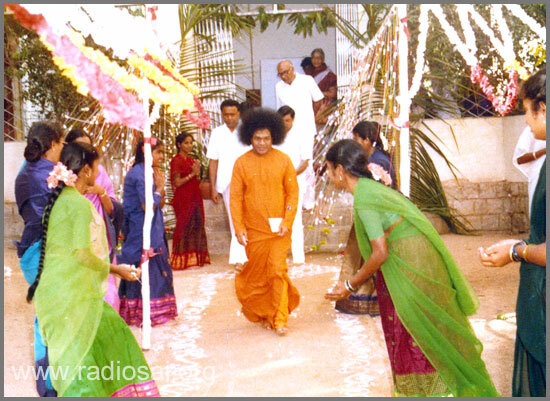 Swami was very gracious; there was one girl who was expecting. After a few minutes, Swami looked at her and said: “You stand up, it is suffocating.” She was so moved by this gesture of Swami, that she started crying. In that interview Swami showing His empty palm asked, “What is in this hand?” Some said ‘right now there is nothing’ and those sitting near Him said ‘Swami, everything is there’. Someone else said, “Swami, we don’t want this, we have You, that is enough.” Then He asked for a paper, He put it in it and the diamond was gone. 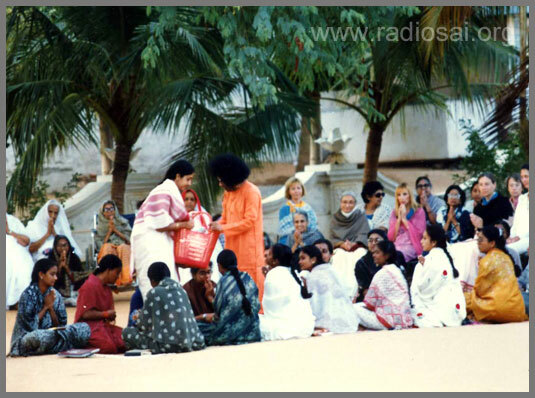 In that interview the girls talked about problems - ‘How do we manage situations with our parents-in-law, when we have this or that problem in our families, how do we solve this with our husband?’ And Swami answered them. Swami said, "God never gives you more problems than you can bear. At that time when you are going through that suffering you feel that it is beyond your capacity to endure it but you do endure it. He will not give you more than that." 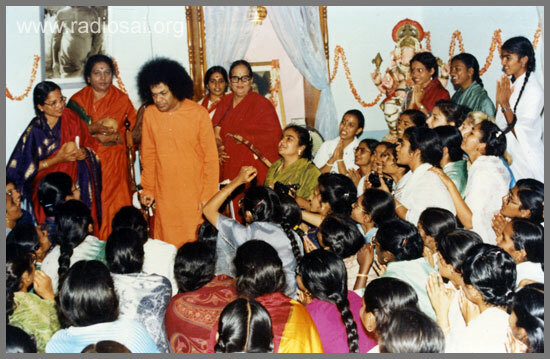 Swami captured the hearts of every youngster, boy or girl, who came to Him. Some knew it when in His presence, some were opening up to this fact as their lives unfolded. And Swami’s gesture of starting His mission of sanitising the education system in this country, by starting a college for women was very significant. For He was not just educating women, but consecrating with His pure love, the mothers and teachers of the future; the foundation and pillars of culture and morality. On November 22, 2012, the Sri Sathya Sai Institute of Higher Learning will hold its 31st convocation ceremony in Sai Kulwant Hall, an annual affair which started in 1982 and since then these ceremonies have been organised uninterruptedly for 30 years.